The first Summit MotorYachts model is a 54-foot flybridge. FORT LAUDERDALE — Trawler builder Kadey-Krogen Yachts said it will launch Summit MotorYachts, a luxury performance brand, early next year. 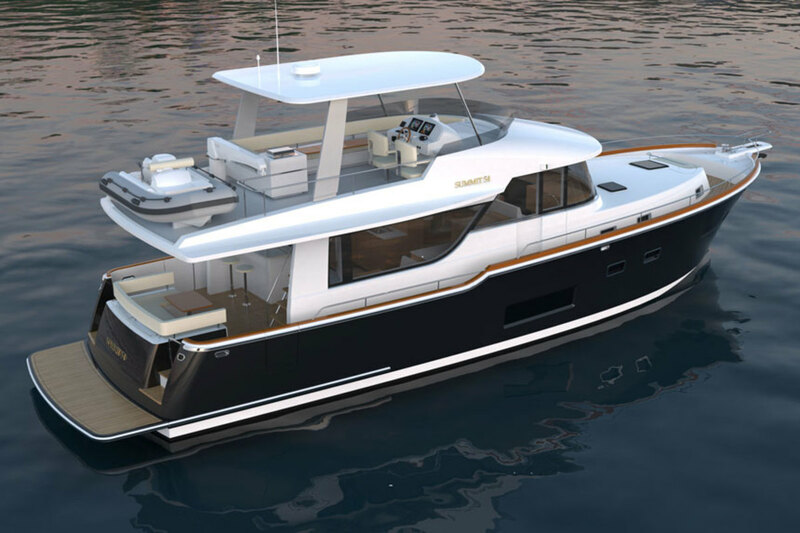 The first Summit model is a 54-foot flybridge dubbed the Summit 54’. Like all future Summit models, it’s designed as a planing hull, and with twin Cummins QSB6.7 engines, the estimated top speed is 26 knots with a cruise of 23 knots. Rather than build the new series of boats as a model line under Kadey-Krogen, management decided to start a separate company to keep the trawlers apart from the planing designs. Summit collaborated with Michael Peters Yacht Design to design and engineer the Summit 54’. Orders are being taken for the 2019 model year. With a beam exceeding 15 feet, the Summit 54’ has an estimated displacement of 45,000 pounds at half load. Below the waterline, the boat is built with solid fiberglass; foam coring will be used above the chines. Polster said hull No. 1 has a buyer and additional models also are under contract.